I relaxed my hair about a month ago, ending a 12 week stretch. 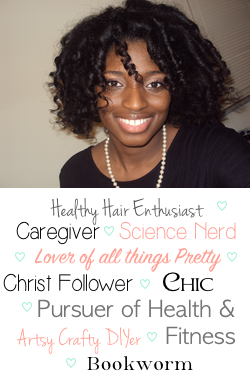 I used Elasta QP's Ultra Hydration conditioning relaxer. I really like the way my hair feels after relaxing with this kit. It also under-processes my hair even if I leave it on for longer than the recommended processing time. Knowing I was soon to relax, I did a protein deep condition the wash day before my relaxer day. On relaxer day, I pre-pooed with Herbal Essences Honey I'm Strong and grapeseed oil for about an hour. After, I based my scalp with vaseline and also coated the length of my [previously relaxed] hair with it. Now that I am intentionally texlaxing/unprocessing my hair, my goal is to have a processing time of only 10-15 minutes max. I didn't make it this time. Came in right under 20 minutes. I also didn't add anything to the relaxer like I have the past two times. However, my hair still came out pretty darn textured and SO very thick. So I'm not upset at all. I'll move faster next time. 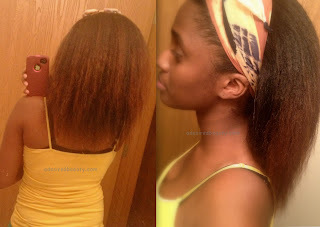 Once I rinsed out the relaxer, I applied my protein treatment, this time using a spray bottle. Although the spray bottle made it a little less messy and Aphogee works well, I am considering finding another hard protein treatment. The sticky mess plus the bad smell makes me roll my eyes when I use it, honestly. I saturated my hair, made sure it was evenly distributed and then used a blow dryer to harden it. I rinsed in the shower, neutralized (3 lathers) and used Aphogee's balancing moisturizer, leaving it on my hair for about 5 minutes. I used Beautiful Textures Rapid Repair Deep Conditioner along with Silk Dream Vanilla Silk Cream Moisture Dream conditioner to deep condition my hair. I mixed them in an empty jar and applied from root to tip. I put on a plastic cap and a scarf and left it on for about an hour and a half, spending half of that under my bonnet dryer. I rinsed with cool water followed by an apple cider vinegar rinse. Since I am participating in this protective styling challenge with a goal of using no heat, I did not straighten my hair or do a length check. But I will be very soon! I applied my usual leave-ins (Aphogee Green Tea & Keratin Restructurizer and Elasta QP Silk H2), let my hair air dry and put it up in my go-to bun. I was pleased with my results! Great results! I love your air dried hair! So I have a couple questions. 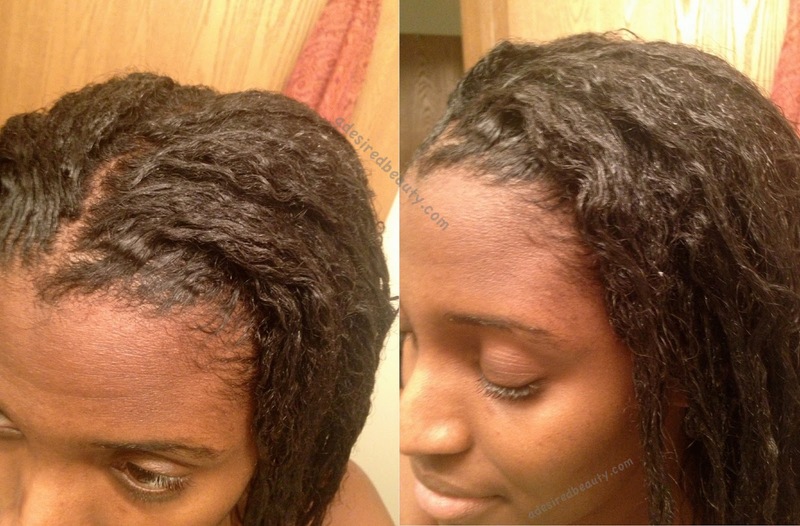 Is the relaxer you used a no-lye or lye relaxer? Also have you ever had issues using the aphogee 2-step? I have the sample packet that comes with the conditioner but I've been afraid to use it (scared that all my hair will break off) lol! Thaaanks Andrea!! It is a no-lye relaxer. I have always used that kind and never had any issues that made me want to try out using a brand with lye. Lol! The first time I used it I was quite freaked out too! Once I read that you are supposed to use a blow dryer to harden it, I had visions of my hair being hard and falling out so I didn't even allow it to harden the first time. That way I could see how my hair reacted to it period. Progressively, as my hair has done well with it, I have allowed it to become hard with the dryer. So other than it being messy and hating the smell, I've never had any hair issues with the Aphogee 2-step. Perhaps try it that way first. I have a 2 year old bottle of Aphogee sitting under my sink. It's awesome for what it is---but I'll never touch it again unless the world is coming to an end and Nexxus discontinues Emergencee! Thank you and thank you KLP!! The only reason I haven't tried another hard protein treatment out yet is because I didn't know where to begin. I already have some product junkie issues so I didn't even want to unleash myself again. But now I will try this one first! The few products I have tried from Nexxus have been worth the price to me. Your hair looks really thick, looking forward to your official length check. I don't care for the smell of the 2 step treatment either but it works.